Hedges have been a part of the landscape for centuries, and in our climate, native hedges do make an excellent choice in many situtations. Some can be pruned to a formal type of hedge, some are best left as an informal hedge and many will flower, providing masses of colour. Plant s such as Lilly Pillies are well recognised as being suited for hedging and screening, however many other species also work well. Close the right native plant for the right climate and you will have a a low maintenance long lasting hedge that will attract birds and bees to the garden. For a very informal hedge, look no further than the Eucalyptus species. Many of these have attractive foliage and flowers as well as acting as a screen. You need a species that can can be pruned, and those with a lignotuber are the ones to look for. A lignotuber simply means that you can cut them back to ground level. This is called coppicing, and it promotes flushes of new foliage as well as restricting height. The more formal species, those that can be pruned include the Acmena, Syzygium, Westringia and Callistemons. Many species have dwarf varieties, some are cultivars and some are naturally smaller growing. 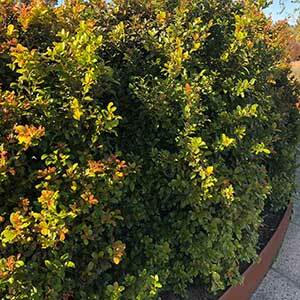 These varieties are the best choice if you are looking for a low growing hedge. Callistemon subulata ‘Brogo Overflow’ is a great variety with attractive red flowers. 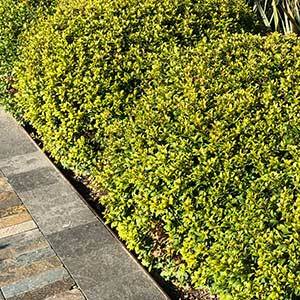 Syzygiun australe ‘ Tiny Trev’ is a good choice for a low growing Lilly Pilly Hedge. Pictured right is Acmena smithii ‘Allyn Magic, naturally low growing to around .6 metre and very easily pruned. 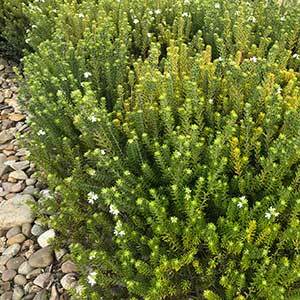 You could also look at plants such as Westringia dampieri and related species which can make great low growing native hedges.